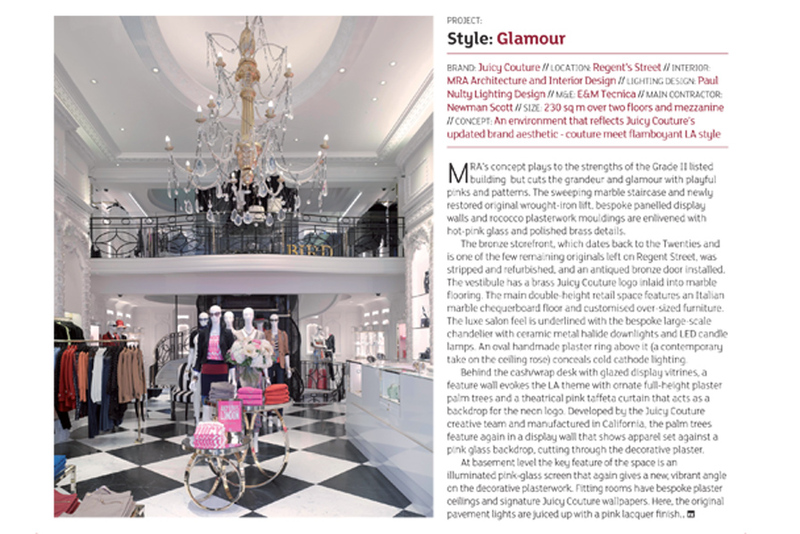 The Juicy Couture Regent Street project and MRA appear in FX Magazine's November 2012 issue. Here's what FX Magazine say about the project: "MRA’s concept plays to the strengths of the Grade II listed building but cuts the grandeur and glamour with playful pinks and patterns. The sweeping marble staircase and newly restored original wrought-iron lift, bespoke panelled display walls and rococco plasterwork mouldings are enlivened with hot-pink glass and polished brass details. The bronze storefront, which dates back to the Twenties and is one of the few remaining originals left on Regent Street, was stripped and refurbished, and an antiqued bronze door installed. The vestibule has a brass Juicy Couture logo inlaid into marble flooring. The main double-height retail space features an Italian marble chequerboard floor and customised over-sized furniture. The luxe salon feel is underlined with the bespoke large-scale chandelier with ceramic metal halide downlights and LED candle lamps. An oval handmade plaster ring above it (a contemporary take on the ceiling rose) conceals cold cathode lighting. Behind the cash/wrap desk with glazed display vitrines, a feature wall evokes the LA theme with ornate full-height plaster palm trees and a theatrical pink taffeta curtain that acts as a backdrop for the neon logo. Developed by the Juicy Couture creative team and manufactured in California, the palm trees feature again in a display wall that shows apparel set against a pink glass backdrop, cutting through the decorative plaster. At basement level the key feature of the space is an illuminated pink-glass screen that again gives a new, vibrant angle on the decorative plasterwork. Fitting rooms have bespoke plaster ceilings and signature Juicy Couture wallpapers. Here, the original pavement lights are juiced up with a pink lacquer finish."